Scintillating scenario of the world’s highest mountains and Himalayan ranges. Mountain Flight in Nepal is one of most do activity when you are in Nepal. If someone says Nepal and mountains are the two different names of a same destination or the place in the world, it would not be exaggeration or hyperbolic expression. Indeed, Nepal is a Himalayan country. The word Himalaya denotes the mountain. In this regard as well, Nepal is a country of mountain which has been the destination of many tourist all around the globe who love to see the scenic and glittering glow smeared in the highest peaks of the world. Especially the travelers who want to see the spectacular view of the Himalayan ranges from the sky and being very close to it in a very short span of time, mountain flight can be the best choice. Many people restrict themselves for the trekking because of their time limitation and schedule. Nevertheless, they still can enjoy the majesty of the mountains within an hour of mountain flight. Moreover, it is also practical to those people who can’t climb the peaks of highest altitudes but have a desire and dream to view it from nearest possible point, the idea of mountain flight would be excellent stamping option. The mountain flight expedition will fly you to offer the stunning views of the highest mountain Mt. Everest and other top ten highest mountains of the world such as Kanchenjunga, Lhotse, and Makalu along with numerous mountains tucked in the Tibetan plateau as well as enchanting panoramas of snow-covered peaks associated with these giant ones. 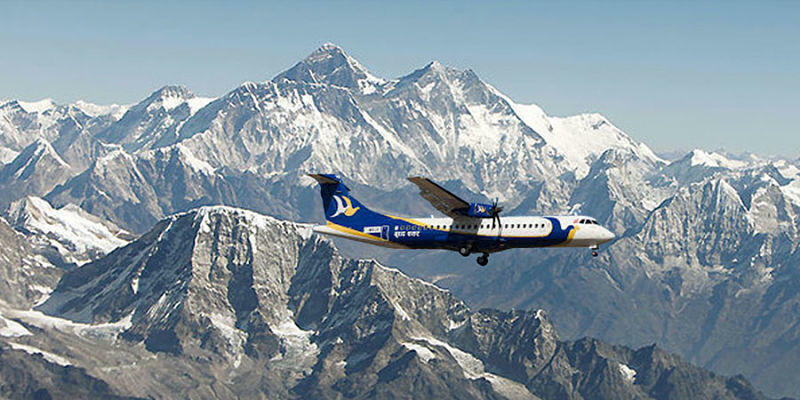 Even though the best flight view season is from September through May, the Everest Mountain Flight is operated every day during the entire year. The mountains flights usually last for one hour starting the take-off at the domestic section of Tribhuvan International Airport, Kathmandu. In the condition of being unable to operate the flight on the scheduled date, the flight will rescheduled for morning of the next day with the addition of the transportation costs. In case you decide not to fly next day, the refund will be paid deducting the transportation costs. For the spell-bind experience of the world’s highest mountains in the world, Buddha Airlines offers you a reliable and unforgettable service. One of the leading airlines of Nepal, Buddha Airlines has been flying in all major airports of Nepal has obtained high recognition and reputation as the branded airlines of the country. It has been provided very secure and hygiene flight service to the passengers with its highly-advanced planes with latest technology. It has fulfilled all the requirement of aviation. It has all the modern avionics, airframe and instrument which are in a modern jetliner. Buddha Airlines operates the aircraft of the American Aircraft Pilot Association and French-Italian ATRs. The former is the Beech 1900D 19-seater aircraft whereas the later one is ATR having 24 to 36 passenger seats. The pilots are well-experienced and highly-qualified who have already flown thousands of flight in domestic and international nautical route. One of the most trusted domestic airlines which flies many corner of the country has been serving the passengers for a long time. It has been flying with high safety and security with the utmost sense of service to the passengers. Everest Express guarantees the life-time experiences with dazzling and glorious views of Himalayas. The flying experience in the Yeti Airlines will be worthy of remember as it takes you into the deep and above 25000 ft. of heights in the realm of Himalayas which only hypnotizes you every moment. The tour of about one hour will be felt short in the sense of its time but long and full of memories and awe feeling in every second of the flight. The window besides of you will work like a majestic and magical screen of television which has been enticing and fascinating you with the natural affluence and affinity throughout the flight. Yeti Airlines has aircrafts made in Britain built by British Aerospace which has the distinguished trademark in the air industry. 30-seater turboprop aircrafts has been designed with high-tech avionics with cutting edge technology. The pilots and crew members are highly-capable and competent in the air department of Nepal who have already flown thousands of flight in domestic circuits. Simrik Airlines has its less destination to fly but more trust and standard as an airlines company because of its outstanding flight performance and service to the air industry. It offers incredible journey to see those magnificent sparkling and splendid view of the Himalayan ranges laid in the northern part of Nepal in the border with Tibet. You will be flying for an hour keeping your eyes and mouth strikingly open and with the sheer sense of surprise and aghast. In Beech 1900 fully-pressurized air-condition aircraft will venture you up close to the world’s highest mountains with its biggest ranges and bold and boisterous stand still shining with calm and composure at the top of the world.